Save on Asset Tracking Costs! Do you already use asset or vehicle monitoring services? A feature-rich asset tracking service best for smaller assets and inventory. 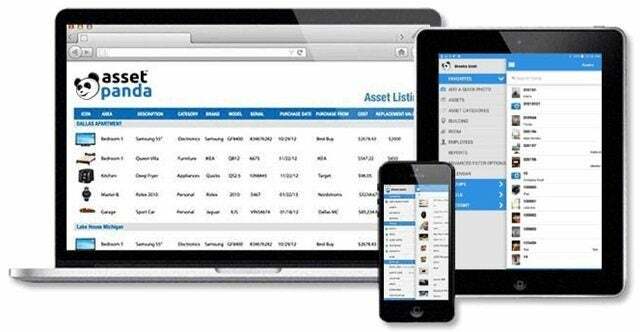 Asset Panda’s asset tracking and management system comes with a lot of features. The interface is flexible, thanks to great customization options and support for third-party integrations. Barcode scanning is the main tracking system, with no real-time GPS tracking or per-asset hardware supported. However, the mobile app includes a GPS location with each barcode scan, and auto-generates reports for detailed auditing. It’s a robust program at a reasonable price. 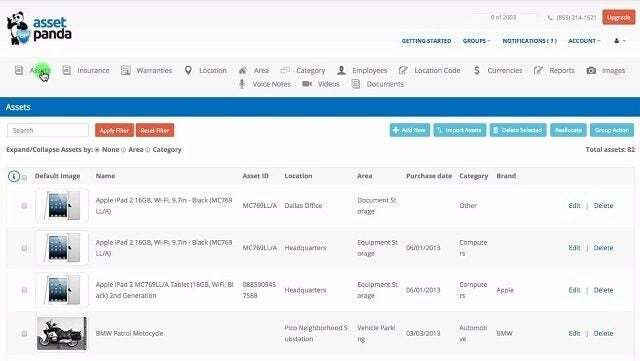 Asset Panda can track numerous types of assets, from tools and equipment to phones, inventory, and office items or leases. Specific industries that Asset Panda specializes in include fire departments, churches, hotels, non-profits, and healthcare facilities, although any small business or operation with a warehouse can benefit from their services. A desktop web application collects the data in a central location, while an integrated mobile app offers many of the same capabilities. Barcode scanning is the main way to track assets, but assets scanned with the app can be updated with the GPS coordinates of your mobile device. Asset Panda offers features beyond simply tracking assets: Facilities and employees can be tracked through the software, and work orders can be generated and managed through it as well. 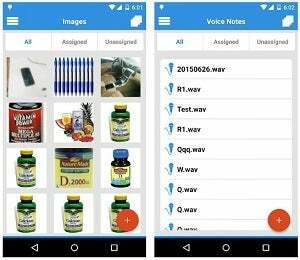 While the software is feature-rich, little hardware is needed – all barcode scanning can be done though the mobile devices, with no need for the expenses of handheld remote scanners. However, it’s worth noting that Asset Panda is not capable of tracking high-value movable assets in real-time. If you have large movable or outdoor assets, such as construction vehicles worth tens of thousands of dollars, you’ll want a service that includes a GPS tracking unit with each asset, such as Samsara or Verizon Connect’s asset tracking services. That said, Asset Panda is effective at tracking the most recent location of smaller movable assets, such as defibrillators, pallet trucks, or power tools. This review takes a look at the main features and benefits Asset Panda has to offer, explains how its support team is set up, and presents pricing information to help you decide if Asset Panda is right for you. 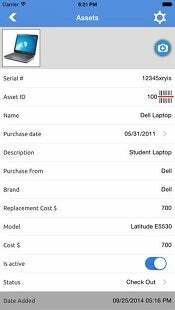 Each asset entry includes a name, asset ID, brand, description, cost, model and activity status. Entries will track purchase or lease information, as well as service contracts and expiration dates, and can include additional data such as photos, documents, videos, or voice memos. Barcode scanners can not only update asset entries, but look up asset details through Amazon or eBay as well. Maintenance schedules, repair histories and depreciation can be automatically tracked. The software uses role-based security. Managers can customize security templates by location, area and category, ensuring each employee can access the information and functions they need while staying safely restricted from anything above their pay grade. 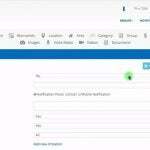 The interface is configurable, with a searchable and customizable dashboard. It’s worth noting that Internet Explorer isn’t supported on Asset Panda’s web application – your team will need to be running on Chrome, Firefox, Safari, Edge, or Opera instead. Asset Panda’s flexible interface extends to customizable insurance records and work orders. Custom fields can be added to each asset entry, each asset category, or all assets. Notifications can be set for date-based tasks, like maintenance reminders, or can be triggered when a specific action occurs. Reports can be generated in PDF, screen, or CSV formats, and data on assets or locations can be easily exported. The Facilities Management module helps managers quickly and easily design all the work orders they’ll need. It also tracks employees’ check in/check out times. In other words, Asset Panda covers basic management of the facility, as well as employee activities that fall outside of basic asset tracking features, and which some other asset tracking services ignore entirely. With Asset Panda’s system, missing or unusable assets – called “ghost assets” – can be quickly identified and removed from active status. By Asset Panda’s estimates, 10-30% of the average business’s assets are ghost assets – this means those businesses are overpaying on insurance for assets they can’t use, while at the same time missing out on Federal and State tax write-offs. Commonly used third-party services that can be directly integrated with Asset Panda include G-Suite, Zebra, Zendesk, ConnectWise and OneLogin. Granted, a few of the more popular integrations used by many business softwares aren’t yet usable: MailChimp, QuickBooks, Salesforce, and Zapier are all listed as “coming soon,” but are not currently available. Asset Panda’s app is available on iOS and Android. 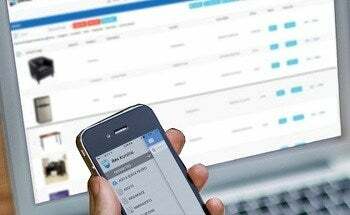 With it, users can carry out onsite audits complete with barcode scanning, generating audit exception reports directly from their devices. Maintenance histories and repair logs are also accessible through the app, while assets like power tools can be requested or reserved as well, making managers as effective on the go as they are at their desks. Asset Panda recommends using the app on an Android device running Android 5.0 (Lollipop) or higher, or on an Apple device running iOS 9.0 or higher. Asset Panda offers support to its customers via phone, email and live chat during workdays from 8:30 a.m. until 5:30 p.m., central time. Video tutorials are available through Asset Panda’s website and are hosted on YouTube. Case studies, white papers and a FAQ page are also available online. Asset Panda does not fully disclose its pricing structure. However, its plan is based on the number of assets tracked, and starts at $1,400 per year. This service includes support via phone, email and live chat, unlimited users, and full access to the features and integrations mentioned in this review, among others. 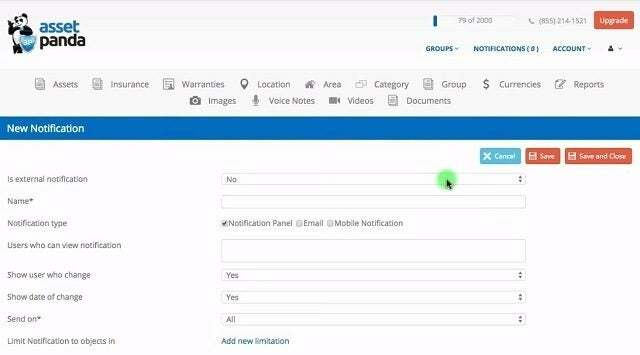 For a full, personalized quote, prospective customers will need to contact Asset Panda directly through a form on their website. Once you’ve collected a quote, don’t neglect to compare it against quotes from leading industry competitors. Tech.Co’s simple online form can help you easily contact the best asset tracking companies in minutes. Asset Panda is a worthy asset tracking service. Its features can handle facility and employee management, in addition to asset management of anything from laptops to forklifts. The email, phone and live chat support provide plenty of options for businesses in need of trouble-shooting. The software is deeply customizable and doesn’t require additional hardware, making it an affordable option for small operations that need a centralized tracking system for easily misplaced or frequently moved equipment. other leading asset tracking providers.